be taught cursive writing in school. Lt Levi Casey issuing orders to troops during the Revolutionary War. 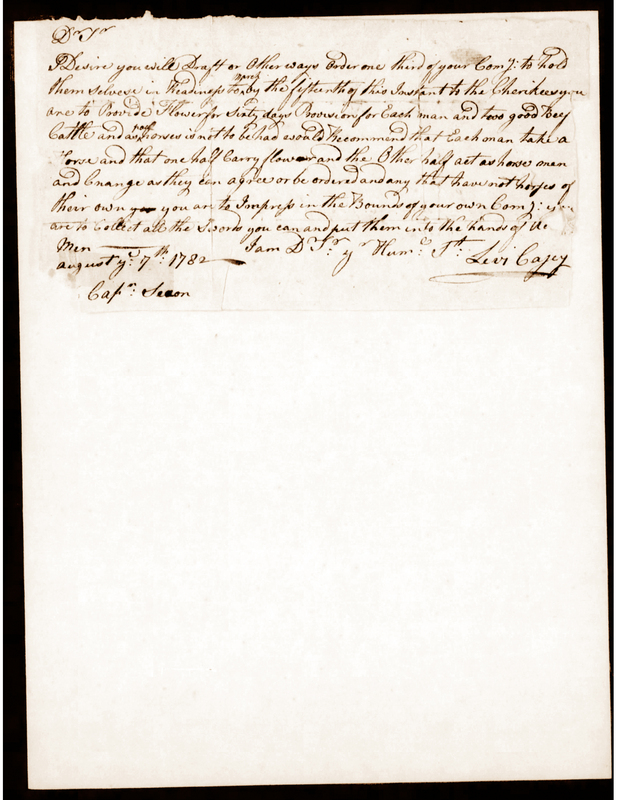 This document is the actual handwriting and signature of Lt Levi Casey issuing an order to his soldiers during the Revolutionary War. It is dated 7 Aug 1782. Levi Casey rose in rank from Colonel to Lieutenant to Brigadier General during his tenure in the Revolutionary War. He was one of the reknown OverMountain men as was David Crockett. Br General Levi Casey served terms as a House of Representative and then had been re-elected Senator but did not get to serve his last elected term because he had a massive heart attack and died Feb 1807. He was first interred at Rock Creek Cemetery in Washington, DC and in circa 1832 he was re-interred in the Congressional Cemetery. His widow, along with her Duckett nephew came to Alabama before 1820 and settled in Lauderdale County, Alabama in the community of Rawhide. She, some of her children, and other relatives are buried in the Casey Family Cemetery on what used to be her property. I desire you will draft or other ways order one third of your company to hold themselves in readiness to march by the fifteenth of this instant to the Cherikees you are to provide flower/flour for sixty days provisions for each man and two good beef cattle and as pack horses a[re] not to be had would recommend that each man take horse and that one half carry forward and the other half act as horsemen and change as they can agree or be ordered and any that have not any horses of their own you are to impress in the bounds of your own company you are to collect all the swords you can and put them into the hands of the men. This entry was posted on May 10, 2015 by Carolyn Murray Greer. It was filed under Br Gen Levi Casey, Carolyn Murray Greer, Cherokee, Duckett, Lauderdale County, Native American Heritage, Remembering the Shoals, Revolutionary War and was tagged with 1782, Br Gen Levi Casey, Carolyn Murray Greer, Elizabeth Duckett, Lauderdale County Alabama, Lt Levi Casey, Rawhide community, Remembering the Shoals, Revolutionary War.